Turtles are well known for their longevity and protective shells, but it turns out these reptiles use sound to stick together and care for young, according to the Wildlife Conservation Society and other organizations. Scientists working in the Brazilian Amazon have found that Giant South American river turtles actually use several different kinds of vocal communication to coordinate their social behaviors, including one used by female turtles to call to their newly hatched offspring in what is the first instance of recorded parental care in turtles. The study appears in a recent edition of the journal Herpetologica. The authors are: Camila Ferrara of the Wildlife Conservation Society; Richard C. Vogt of the Instituto Nacional de Pesquisas de Amazônia, and the Associação de Ictiólogos e Herpetólogos da Amazônia; Renata S Sousa-Lima of the Cornell Lab of Ornithology; Bruno M.R. Tardio of the Instituto Chico Mendez; and Virginia Campos Diniz Bernardes of the Instituto Nacional de Pesquisas de Amazônia, and the Associação de Ictiólogos e Herpetólogos da Amazônia. "These distinctive sounds made by turtles give us unique insights into their behavior, although we don't know what the sounds mean," said Dr. Camila Ferrara, Aquatic Turtle Specialist for the WCS Brazil Program. "The social behaviors of these reptiles are much more complex than previously thought." Some behaviors of the Giant South American river turtle have been well known for some time, including the tendency to aggregate in huge numbers during the nesting season. However, the mechanisms used by turtles to coordinate their activities have yet to be explained. This study focused on the sounds made by the turtles as a possible means of facilitating social behavior. Working on the Rio Trombetas between 2009 and 2011, the research team captured 270 individual sounds made during 220 hours of recording made with both microphones and hydrophones when the turtles were swimming through the river. The scientists then conducted spectrographic analyses on the repertoire, which they subdivided into six different types of vocalization made by turtles during the nesting season, which begins as the reptiles leave the seasonally flooded forest for nesting beaches along river banks. The scientists also sought to correlate vocalizations with specific behaviors. Sounds made by the turtles while migrating through the river or basking tended to be low frequency sounds, possibly to facilitate contact between turtles over longer distances. Vocalizations made during nesting tended to be higher frequency sounds, possibly because higher frequency sounds travel better in shallow water and in the air. The highest diversity of sounds are used by females about to nest; the researchers theorize that the animals use these sounds to decide on a specific nesting site and to synchronize their movements (the turtles leave the water in a single-file procession). 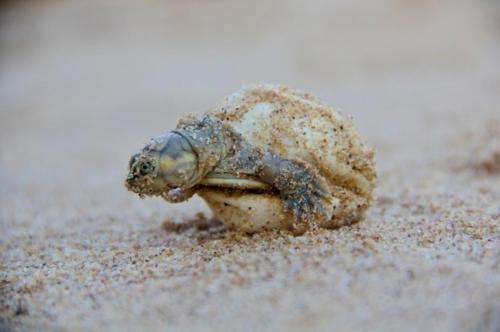 The hatchling turtles themselves make sounds before they hatch and continue to do so as they clamber out of the nest chamber on the river beach. The sounds, the authors speculate, may stimulate group hatching. The females, in turn, vocalize in response to the nestling calls, perhaps guiding the nestlings into the water. These interactions—the first recorded instance of parental care in turtles—were featured in a 2012 study appearing in the Journal of Comparative Psychology. Using sonic transmitters, the team also discovered that the hatchlings remain together and migrate with adult females for more than two months. The Giant South American river turtle is the largest of the side-necked turtle family and grows up to 80 centimeters (nearly three feet) in length. The species is only found in the Amazon River basin and is now threatened by unregulated consumption of the turtles' meat and eggs. "Groundbreaking studies such as this one can help us better understand the complex relationships between both individual animals and their environment," said Dr. Julie Kunen, Executive Director of WCS's Latin America and the Caribbean Program. 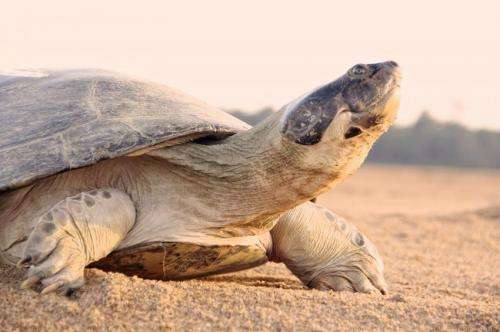 "Protecting the still sizable populations of Giant South American river turtles will also enable us to conserve the behavioral richness of these reptiles for future study." Research on the Giant South American river turtles is part of a new long-term WCS conservation program called Amazon Waters, an initiative focusing on the conservation of aquatic ecosystems and species. The Wildlife Conservation Society works to save turtles and tortoises around the world. In 2012, WCS launched an organization-wide program to revive some of the most endangered turtle and tortoise species. Efforts include breeding programs at WCS's zoos in New York, head start programs abroad, and working with governments and communities to save species on the brink of extinction.